In 2017, the small businesses have been completely shifted to digital businesses. Thereby increasing the demand for security of confidential data. 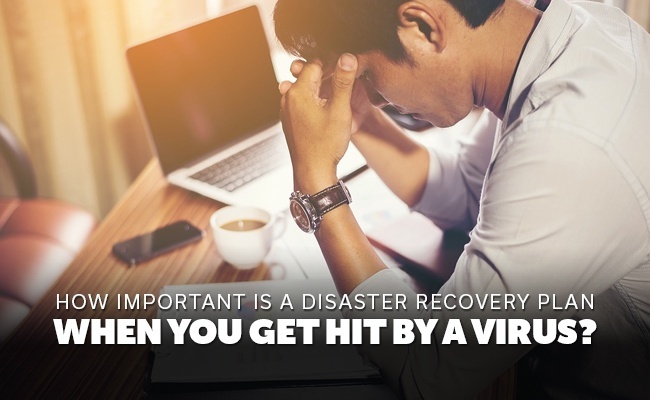 Disaster Recovery Plan is nowadays considered one of the best plans for small businesses because of the fact that in small businesses there is only one or two persons that are handling everything starting from the marketing to web development and CEO to administration. So handling a lot of things become a headache if in a case your business faces a downfall because the data got corrupted. So one must have pre-planned everything before the disaster i.e., viruses, malware, natural breakdown. What happens if no Disaster Recovery Plan? According to the recent stats, 74% of the companies faced the data corruption in their workplaces and pathetically only 32% were able to recover it and 16% miserably failed to recover. During the past few years data loss has increased more than 400% at the small business level. Now the situation is very clear, the companies can’t bear the loss of data because that’ll somehow lead them to downfall of their businesses. The worst case scenario will be they will lose their clients, the work they have done so far on projects, update of the previous records will fail them miserably and their market reputation will be down which ultimately leads them to shut down their business; they have put so much effort in. To escape this scenario small businesses can take advantage of the disaster recovery plan (DRP) and can overcome the data loss. This is all because of the fact that small business owners assume data loss isn’t a big deal, and another wrong perception is that they consider that data is important for only big companies. Importance of Disaster Recovery Plan! Let’s have a sneak peak on the benefits of having Disaster Recovery Plan. Natural Damage to Building i.e., Fire, Flood, Explosion etc. So security is needed for such type of disasters that come unknowingly. DRP basically serves for this purpose. As more and more data is shifting online so the vulnerability of data has increased leading to cyber-attacks. Since everything is pre-planned so there is no need to rush in making plans to overcome the situation. Already back-ups are made, recovery plans are in progress; so no headache of making decisions. Your client’s data is in the safe hands and back-ups are there so there is no need to consider how we will be able to save the clients data after it’s all wiped out. No doubt, that the hardware comes with reliability but there are exceptions that can lead to machine disordering. So DRP saves the day of disaster as data is being regularly updated and back-up. If you fail to recover your lost data the customer may move to your competitor. So small businesses must be very keen to keep their customers involved in their loop. DRP will keep your data available to the customers, so there is no need to worry. In short, save your business to save your customers. Human make mistakes and unintentionally lead to loss of data. So DRP let you store error-free data and also let you keep checking the data for any updates. How to make a Disaster Recovery Plan? Define your critical business functions/processes. Redesign and implement the required changes. I hope you liked the blog. Keep visiting the site to keep yourself updated! Tagged:Tags: benefits of a disaster recovery planimportance of disaster recovery plan pdfWhat is disaster recovery?What is the purpose of disaster recovery planwhy do you need a disaster recovery plan?Why is it important to have disaster recovery plan?